Home » Hot off the PResses! » Just Pressed: The Core DJ’s enlist Charlotte, NC to host their 13th DJ Retreat this September! ATLANTA, GA – Now in it’s 6th year, The Core DJ’s have rightfully become the premiere DJ coalition, acting as a union for the most influential DJ’s, members of the media, models, industry tastemakers and artists & boating over 500 members and counting! 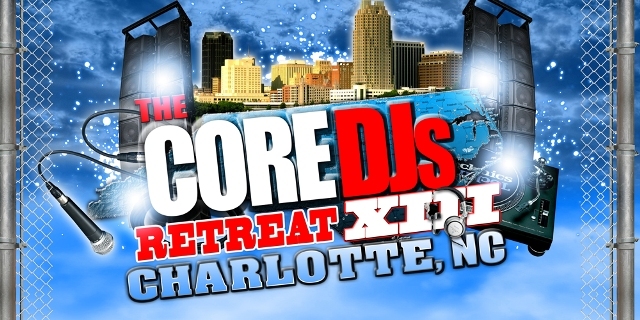 The Core DJ’s Retreat 13 will take place in Charlotte, NC during the weekend of Sept. 10-13, 2010. The Core DJ’s have occupied the Hilton Charlotte University Place (8629 JM Keynes Drive, Charlotte, NC 28262) as the event’s host hotel. Room rates are starting at $119.00 per night. The Core DJ’s have successfully presented past retreats in Chicago, Miami, St. Louis, Houston, Atlanta, Dallas, New Orleans, Las Vegas and Orlando, and will continue to do so, making their mark in every city that is apart of the movement within the music industry. The retreat unites industry professionals for a weekend of networking, festivities, and honoring some of the past, present and future innovators of the entertainment & music industries. Preregistration is now open but the last day to register will be September 5th. For a tentative itinerary, room rates and on-site registration rates, please visit www.coredjsretreat13.eventbrite.com or www.coredjsretreat.com. For more information regarding any previously submitted registration or sponsorship for The Core DJ’s and The Core DJ’s Retreat, please contact Donata Ellis by email at Donata.coredjs@gmail.com or by phone at 877-333-9940 ext. 2. For media requirements and to submit a request for credentials, please contact either Janie Jennings or Tuesday Knight at Press.CoreDJs@gmail.com or 877.333.9940 ext. 3. Now approaching it’s 6th year, The Core DJ’s, founded by national Mix Show DJ Tony Neal, is a premier DJ coalition that house over 500 of the countries most influential DJ’s, radio personalities, musicians, producers, models, executives and tastemakers. The semi-annual Core DJ Retreat(s) is one of the most highly anticipated music industry events of the year, specifically known for its incomparable new artist showcases and networking atmosphere. 1 Comment on Just Pressed: The Core DJ’s enlist Charlotte, NC to host their 13th DJ Retreat this September!